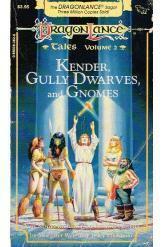 DragonLance: Kender, Gully Dwarves and Gnomes by Margaret Weis and Tracey Hickman, Sci Fi. Book is in good condition, all pages intact. The three sons of Caramon Majere wake up on a gnomish sailing vessel after losing a bet. A vessel questing for the Graygem. What lies in store for Sturm, Tanin and Palin? And who is this mysterious Dougan Redhammer?